Early last week I was telling someone about my stint as a card designer/art director back in the early nineties for Marvel/Fleer Entertainment. This was during the massive spike in card popularity and I worked on almost all of the card series released during that time, including a card game based on Marvel SuperHeroes called OverPower. Bringing that up again made me think about Eve. Like Baseball, Soccer, Hockey, or even SuperHeroes, Eve has its own cast of famous and infamous characters. People who have helped shape the history of the game over the last ten years. Why not make a series of Trading Cards featuring some of these characters? Being a pirate myself, my first thought was a series of pirate themed cards. 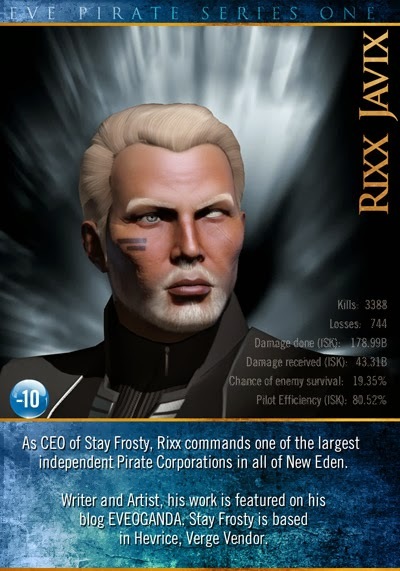 I started a thread on Stay Frosty forums asking everyone to help me name famous or infamous pirates from Eve's vaunted and rich history, and I was off to the races. You can see the growing set for yourself (Low Res) or (High Res). I can easily imagine this series expanding into other areas of Eve, High Sec, WH, Null Space, but for now I'm only focusing on pirates. The list is rather long and growing, so I have no idea ( or plans ) on how many cards I may end up producing. And to answer your next question, no I will not be producing cards on demand in exchange for ISK. The characters represented on these are my choice and mine alone. I do take suggestions and appreciate ideas, as always. Part of the reason I wanted to do this series was to learn more about Eve's rich history and to meet some of my fellow pirates of yore. It can be tricky when you take into account the selling and buying of characters over time, some infamous pirates are in other players hands these days. But generally I'm going to ignore all of those complications and try to focus on each character's contribution to the game. Which is often easier said than done. There is also a very fine line surrounding the entire definition of "pirate" anyway. My own personal definition changes on a daily basis and I don't always see myself as a "pirate", but more of an opportunist. Or even just a PvPer. So, for sake of argument, I'm defining "pirate" as someone who primarily operates in Low Sec space and does so for nefarious results. That is rather open-ended, but I think you'll agree the entire play-style is rather open-ended. I hope you enjoy the card set as it grows. I'm having a lot of fun doing them. 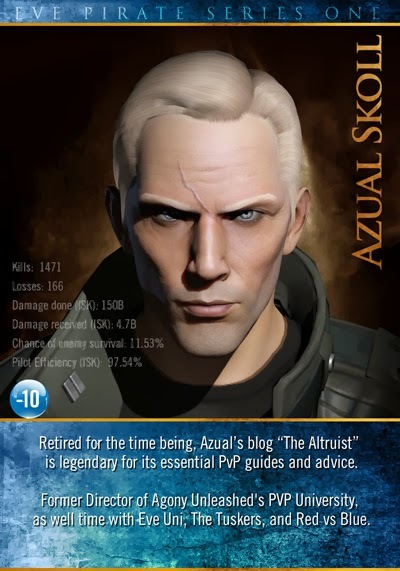 And yes, we should all be bothering CCP to actually produce real cards like this. That would be extremely awesome and help introduce Eve to an entirely new audience. Miura Bull would be my suggestion. Bull is already one of the cards. Thats an awesome list of bodies. Very happy you got Mynxee, Kane and Shaniqua in that list. What about 00sage00 and Shae Tiann? Vladimir Norkoff of Taxman fame? Already on the list, just haven't gotten to them yet. Oh and may I humbly suggest Fintarue, Petrus Blackshell, and Crake Gaterau, and ofc the legendary Lhorenzho. No W0wbagger or Grarr Dexx? Are Miura Bull and Santo Trafficante evil twins? It is a tad eerie isnt it?